The cases are slippery and get scratched up from dropping, from keys and even from pets. When we drop our expensive and precious phones we are filled with panic. Companies have taken advantage of this by selling cases for our valuable devices. 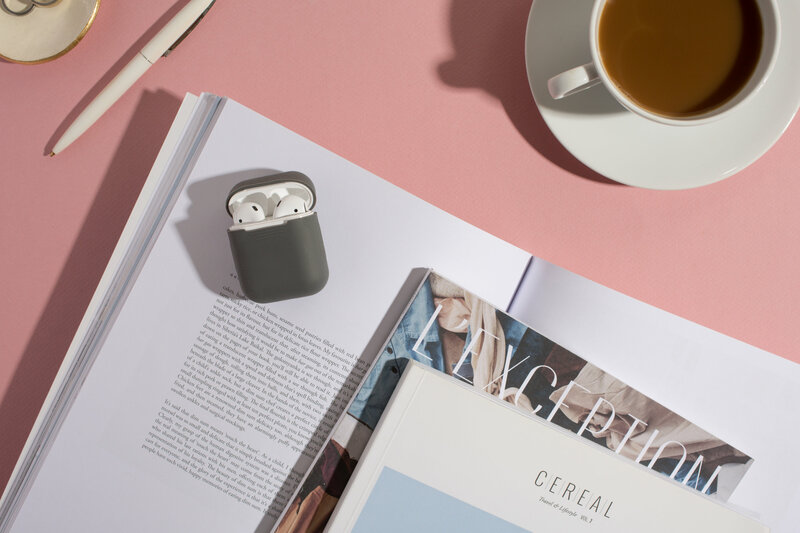 The popular Airpods are now being paired with a cover–not for the wireless headphones themselves but rather for the case that stores and charges them. But are Airpod case covers beneficial? On the market since December 2016, Apple’s wireless headphones, AirPods, have become a common gadget even though they are not the most reasonably priced: $219 Cdn in Canada and $159 USD in the US. AirPods come with a plain white case that charges the headphones. Now people have purchasing protective covers for their AirPods cases. At first, the thought of people putting rubber around their AirPods case puzzled me–after all, it ruins the look. Occasionally, I like to indulge a little on high-priced and trendy things like Apple products. But these covers hide Apple’s great brand. On the other hand, since all the original AirPod cases all look the same, some people might want to individualize them in a unique way. Appealing to people like me, some covers feature name brands such as Gucci and Adidas. Other unique covers come with a wristband. There are also covers that feature animated characters including Mickey Mouse and Hello Kitty. Cases for iPhones have a protection factor as well as an accessorizing factor, so is it the same for these AirPod cases? To answer this question I asked the owners of case covers whether or not they considered them a necessity that all Airpods owners should eventually purchase. A majority said they never thought about the protection the cover provides in the first place but were simply purchasing them because they saw others getting covers and enjoyed how the covers looked. One user I asked said he bought his cover simply because his “dog chewed on it.” There was no damage to the AirPods themselves and the case still worked fine but the pooch’s teeth marks were very apparent. When asked if the case covers provide good protection specifically when dropped, the common answer was yes. Many said the cover provides more security, preventing unwanted bumps and scratches when the case is in places susceptible to damage. This is an advantage for me because I have dropped my case a few times although luckily there was no damage to it. So, if it happens again I would feel more assurance if the case had a cover to protect it from the fall. But although covers for phones can help protect them from serious damage like cracked screens, serious damage due to dropped AirPods cases is rare. The case will probably still work fine. The cover just helps ensure that the AirPods case is protected from all damage whether from drops or from being kept in a pocket with your car keys or around other sharp objects. The rubber covers seem to solve that problem and protect it from getting scratched or damaged and can maintain a clean and new look. Many AirPod users find the AirPod case to be quite slippery causing it to fall out of their jacket pockets. Online, users often ask how they can make their AirPod cases less slippery and prevent them from falling out. The common rubber cover is beneficial in providing more grip. I would recommend AirPod users to purchase these cases not only for the look but for the protection. Since Apple’s warranty does not cover damage from dropping or scratching devices, if you want do end up damaging your AirPods a replacement would require an out-of-warranty fee. Most of the people I spoke to said they bought covers for $15.00 Cdn while others only spent $2.00. The Apple Store sells a waterproof case accompanied by a keychain clip for $39.95. However, it doesn’t take much to get the benefits you need, so the higher-range prices are a bit unreasonable.The $2-$15 versions will do the trick just as well as the expensive edition from Apple which provides the same amount of protection. Initially I found these covers to be a waste of money and I could not picture getting one myself but after gaining more knowledge on this I might consider making a trip to the store myself and it won’t break my piggy bank.